Jeff is a Vermont native and loves the environment that this state has to offer. He has a degree in music performance and education from Johnson State College. His work experience ranges from teaching, to landscaping, carpentry, and managing an ice rink. 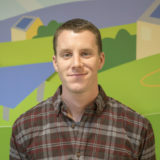 Jeff is joining SunCommon’s installation team to help brighten the future of solar by installing arrays across the state. He enjoys being outdoors, running, and finding any excuse to start a new project. With his hands-on expertise, solar installation is something you can expect to see Jeff doing any time of year with a smile on his face.